So ... where was I? 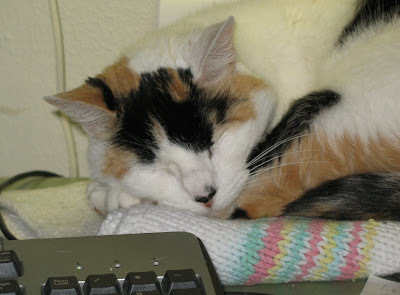 This past week has been so off-kilter at my office, I've lost track of myself. Intermediate, because all of the reddish yarns are singles, space-dyed and waiting to be plied. I'm saving the details on these for when I post about the finished yarn. and I smelled smoke. And I'm not talking sniffsniffsniff...is that smoke? I mean, smoke like Crazy Horse's Bureau of Tribal Communications had moved into the bathroom. So I jumped out of the shower all soapy and wet, and threw on my bathrobe, and went tearing around the house in search of disaster. Nothing. I pulled down the attic stairs and stuck my head up there. Nothing. So I figured I had time to rinse off, and get into some real clothes, and then investigate further. The whole time I was running around the house trying to put my jeans on while hopping on alternate legs, I smelled smoke that I couldn't see. The sun machine was on. It was 96 degrees. Humidty on the "sauna" setting. And I discovered that our neighbors were not only firing up the barbeque on two grills, but they'd lit a nice romantic fire in their patio chiminea. See? And their mood-enhancing hotspot is located about ... oh, 20 feet or so from our central air return. I tried to imagine the conversation: "Honey, I don't think it's quite hot enough out here ... let's light a nice romantic fire in the chiminea, eh?" CNN cuts him off midsentence so they can cut to an Urgent, Developing Situation in which the World's Most Rich and Famous Floozie is being stuffed, weeping and disheveled, into a sheriff's car. So of course people don't know how to act. If you don't know what's actually important in the world, how can you possibly know when it's the right time of year to light a nice, snuggly fire? So I went back inside. Meanwhile, back inside the Asylum, although we are annoyed that rich and famous floozies can get special legal privileges and a temporary repreive from jail by whining, crying and refusing to eat (how anyone could distinguish a celebrity hunger strike from compulsive dieting remains to be explained) ... the Management of the Asylum is not actually interested in famous floozies. The yarn is "Midwinter," which I'd ordered from Jo's Ebay store. But the Ouessant was a surprise. It was even marked "Lagniappe," Louisiana-style. This is a good, true-to-color shot of the wool. Doesn't it look like a cup of espresso? The Ouessant will sit in an airtight container for awhile, where it will pupate, and decide what it wants to be. There is deifnitely enough for a pair of socks or a hat. I can't tell you how delighted I am to receive this. A fleece sample from a rare breed is always a treat, and there is nothing like sinking your nose into a lanolin-rich wad of wool from a nice, clean, well-kept sheep. I feel compelled to note that the Ouessant -- just in case you're not up on your sheep breeds, although you have likely deduced this from the name -- is not an Irish breed. It's a sample from the Ouessant fleece that Jo picked up from her visit to Renee in Brittany last month. See Jo's May 21 post for photos of the actual sheep, and for more information about Renee. Use the link to Celtic Memory Yarns, above. This particular sheep is named "Muguet," or "Lily of the Valley." I love having wool from a sheep with a name. This Sunday, I'm a little out of sorts. It's Father's Day in the US, but my Dad is no longer around to knit socks for. So I entered a pattern for sandal socks in the Father's Day contest at Knitivity. Apparently, I was the only knitter to enter the contest. I'm hoping that's only because everyone's been too hot to knit, and not because you haven't been buying Ray's wonderful yarn. It's soft, gorgeous stuff, wonderful to work with and even in our blistering Southern heat, you can still make socks. Which I did. Here's a photo, which I took rather carelessly, with the sock not pulled up all the way, or even neatly, on the foot of my patient sock-model, because I was hurrying to beat the deadline for the contest. Yarn: "Poolside" from Knitivity. 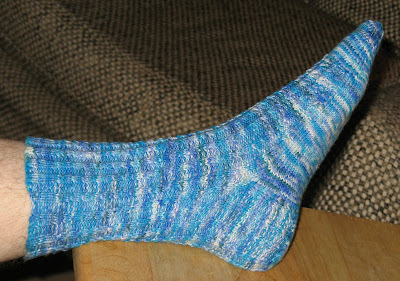 For the pattern, go to Knitivity, and buy some of Ray's luscious yarn to make the socks with. The pattern for my Mini-Cable Sandal Socks is posted over there. Knit some for your Dad. Meanwhile, I have another design deadline, for a worthy cause. Which shall be revealed, all in good time. i know nothing of yarns and should recognize an opportunity to keep my mouth shut, but from here the quessant looks like a small minky creature which will awaken, yawn, stretch leathery little wings and fly away. Oh please tell us more about the quessant. When your raw fleece arrived was it really greasy and did it smell really sweet? Mine did and even after 2 washings and rinses, triple carding, pulling off the batts and storing them in a plastic tote to await spinning, when I open it I still smell very strong and sweet scent! My sheep friends tell me I'm crazy and that no such sheep exists! !